In the first article of the first issue of AArchitecture, ‘Sexymachinery’ is mentioned as the last in the wave of radical AA journals. This last wave was how I first heard of the journal. It was conceived in 13 parts, with a possible 14th instalment, (though this is not so certain). Further investigation involves trespassing upon the ‘AA Atlas’ and typing in S-E-X-Y—M-A-C-H-I-N-E-R-Y and clicking search once. 2 results, (23 results when it is all searched as one word, ‘sexymachinery’ ). Of the two hits the top one fits the preconception of the thing-to-be-found (the bottom result, ‘Manliness and civilization [electronic resource]: a cultural history of gender and race in the United States, 1880-1917’). The ‘detail’ post shows a quick glimpse of the journal, publication frequency ‘irregular’ and ‘varying paper sizes’ with the small yet disheartening detail (for a desire to discover the thing) ‘only 4 issues printed’. No trace of the unprinted issues, the library has issues 1, 5 (2 copies) and 9 (2 copies). Arriving through the book shop, past the open door of Projective Cities, one enters the archive and then realizes the impossibility of the task at hand. The archive in its totality greets the curious eye upon arrival. The ordering system of an archive, indecipherable. Thankful for the presence of Edward to guide you to the location (and able to provide information on all possible topics (and detours) that you might or (more likely) might not have considered in this holistic search). North west corner of the room. Top shelf. Just within reach of the fingertips of a 5’10” person standing on the tip of their toes. A stack of envelopes, some stark ‘conservation’ white and others in varying progressive stages of yellowing. Carefully pulling them down one by one, (while gauging the shape of each item within, as it tests the limits of its C4 sized confines). Finally coming across ‘SM 05’. Placing the envelope carefully on the snow white archive table. Now, careful, to place one’s hand inside and pull the object in question out or to upend the container and slowly shake it carefully until the desired object peeked through? A mixture of the two were employed after much hassle, but ultimately: successful. Two copies of the issue were contained therein (one with a significantly more present addition of sellotape, doubly fragile, it is placed back into the envelope and away from any extra handling). Now the object (in question). Its a little ambivalent in how it is to be used, the object questions the facing page, a block of text. 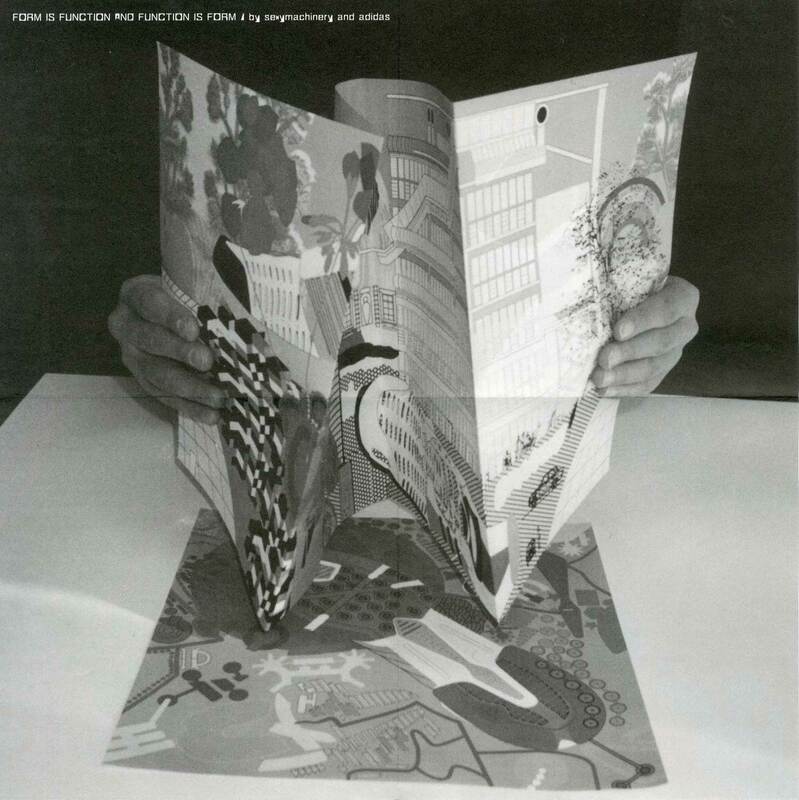 The facing page, pulling upon it, begins to unfold, revealing a larger sheet of paper, that itself continued to unfold (the thickness of the paper seems to suggest something on the billboard scale). Upon further inspection, it reveals that this issue is actually a composite of various paper sizes (one remembers the ‘varying paper sizes’, but both across issues, and within issues?). It takes its form in the collection due to the paper size with the most number of occurrences. The bottom right corner shows a small quote ,’Portrait…problem of recognition’. Signed with one ‘Peter Carl’. And the quote facing this on the right, ‘I look at you, you look like me.’ A green portrait occupies the top left page, that begins a series of green tinted portraits in diminishing size (Fibonacci sequence?) Below the signature of Sexymachinery and in the middle the all too familiar A.A. Library shelf stamp (an intruder to the Archive), contending with the obligatory information of the journal itself (outdated price and date of first issue). Examining the inscriptions of the poster, it lies half open on the table. N, A picture of Le Corbusier’s man adjacent to Elvis Presley (in mid-boogie pose). O (with a dot in its centre), a smashed car wing mirror, yellowed and deteriorated. M, two people, one standing on the shoulders of each other, a set of shoulders also holds up a UHU stamped jumper. The contents page, suspicious of conforming to a bound space, taking upon itself to cross the page divide, and thus making the page size exist somewhere in between the spread and the page. Each line, a space of its own. Flicking through the book, I land on page 11. A transcript of an email. This flickering passage through the journal is disrupted by an insert. It pops out, between the thumb and the book. Here the page measures a good four times the width of the main book and around one and half its height. The function of ink, followed by the form of paper. (Accessed 17th of September 2015, as of which SM 05 was found 8th envelope down and subsequently returned to the top of the then 18 envelope stack). In terms of the word ‘discovery’, one traces back etymologically to the meaning, ‘to obtain knowledge or sight of what was not known’. Obtaining sight of the journey to a previously unknown thing, and then understanding the means in which to understand that thing is the purpose of this simple piece.